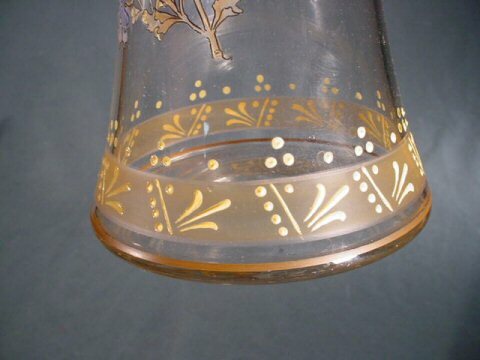 DESCRIPTION: Here is an absolutely wonderful hand-blown glass beer stein: large 14 ½ inches high. This piece was also hand painted in the finest of the art form. 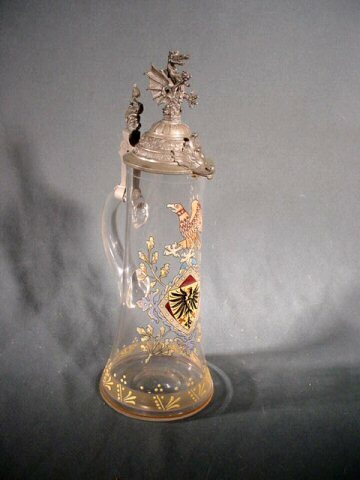 Usually, beer steins are the "Bavarian thing," but this type was strictly Prussian in nature and style. 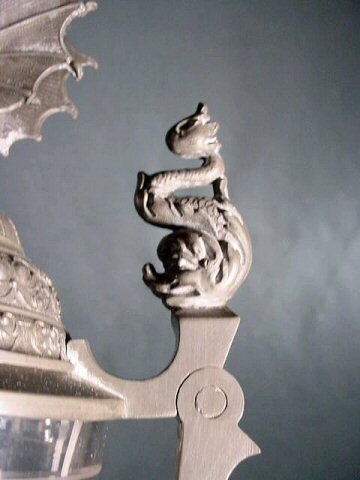 The pewter lid has a rampant-dragon motif, while the pouring spout has a sea creature's head and the thumb lift bears a diving dolphin. 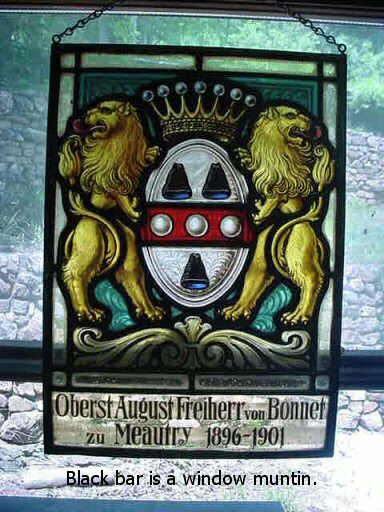 The crest is of the Prussian Hohenzollern family giving the possibility of royal connection. 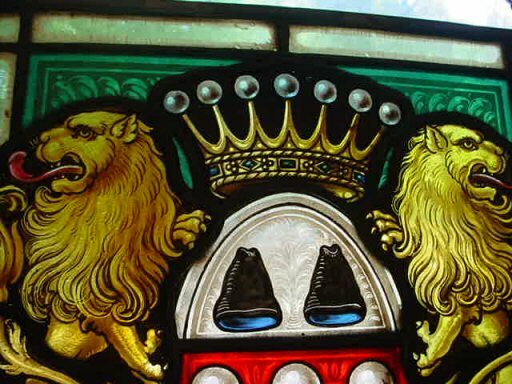 The painters, jewelers, woodworkers of Germany were a law-abiding lot and it was forbidden to use the royal crest on anything except the things for the emperor's use or pleasure. It was usually just not done. 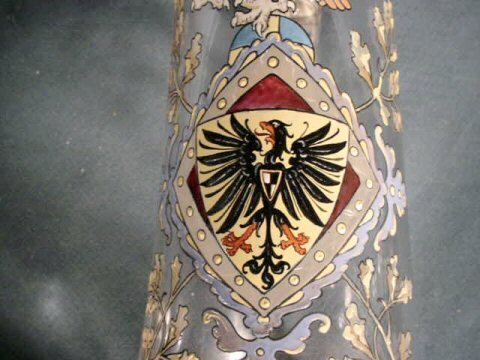 The other eagle seen above the Prussian crest is the style used on articles throughout the Hohenzollern castles. 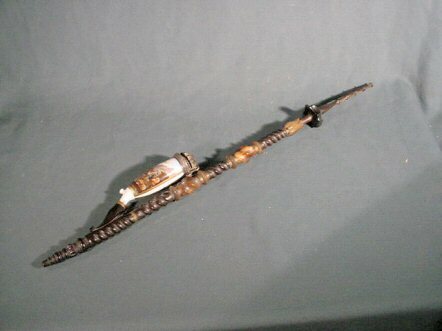 It usually was associated with hunting. The bands at throat, tail, and wings are suggestive of a theme almost Egyptian or Indian. This was Prussian as well as their interest in ancient cultures was well noted. 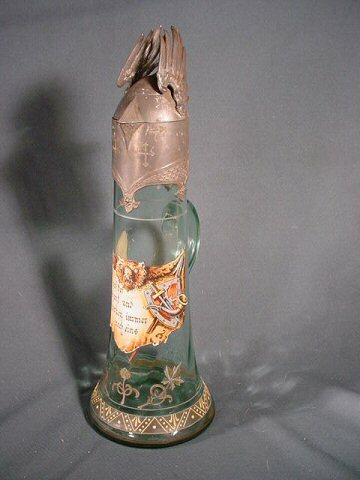 Here is a perfect specimen of a rare and seldom-encountered art object of the Kaiserreich! Historic treasure! 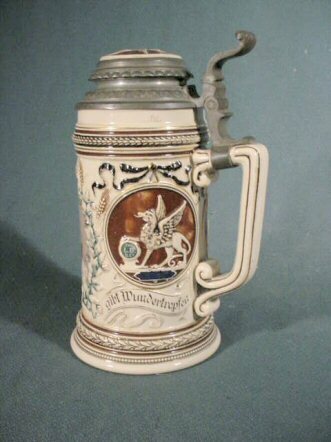 DESCRIPTION: Here is the finest beer stein that we have every seen or offered. 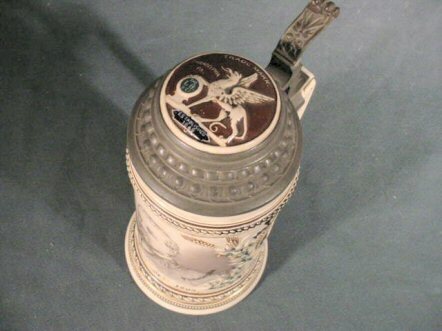 This, by no means, is the typical Gemütlichkeit Bavarian stein. 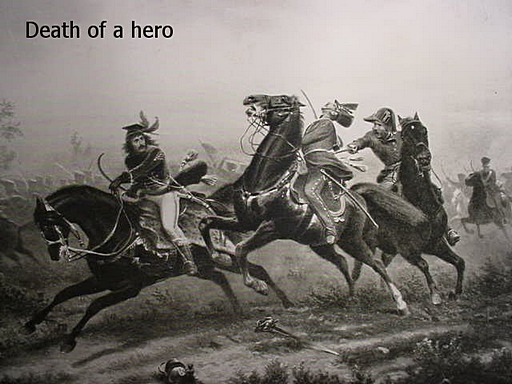 This is as Prussian as Marshal Blucher. 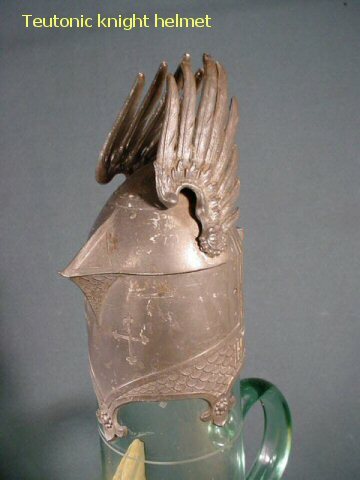 At the top the lid is fashioned like a helmet of the Teutonic knights with the wings of a knightly leader or Ritterführer. The wonderful accuracy with buckles, rosettes, chain mail, and evangelical crosses as eye slits is evident. 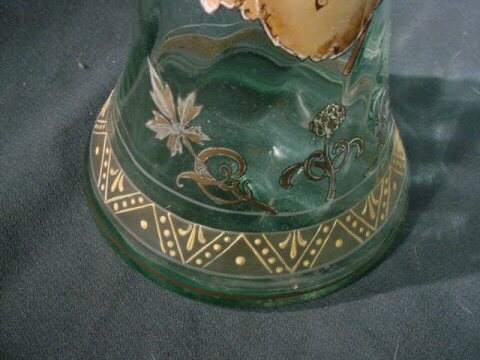 The body of the stein is hand painted with the geometric designs in the art-deco style of the turn of the century. It may be as early as the 1880's. 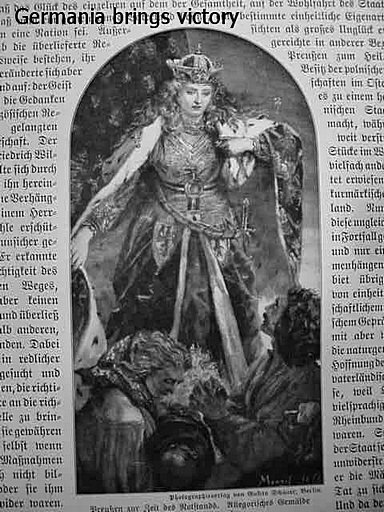 This art flourished in Germany from 1875 to the mid 1920's. 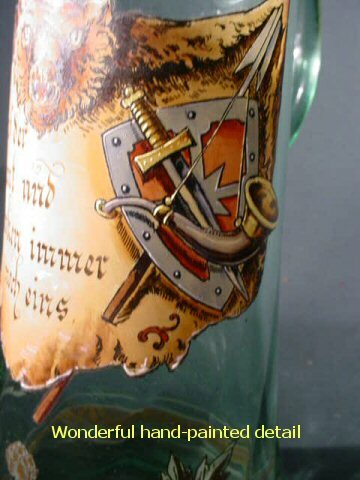 The mid section of the stein has a grimacing bear and a potpourri of Teutonic weapons depicted along with a hunting horn. 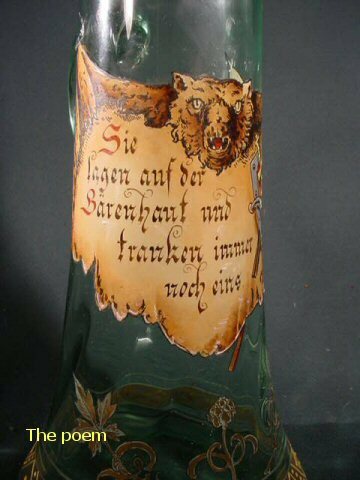 The saying seems to be: "You are on the bearskin and still you are ever drinking"! I don't now about you guys, but I think that sounds pretty Gemütlich! Cozy! 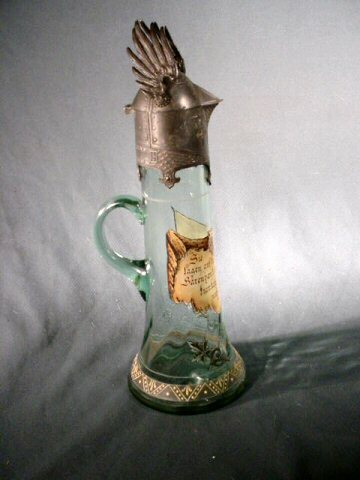 This stein is a pouring stein and could well be for wine rather than beer. It is quite tall. It measures 17 inches from the bottom to the wing tips. 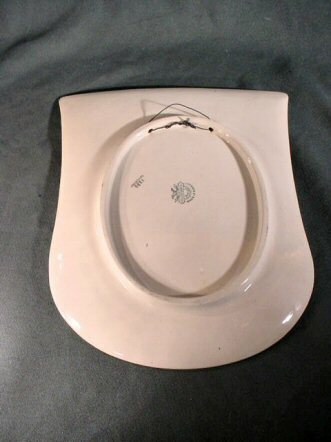 The base is 5 ½ inches in diameter. 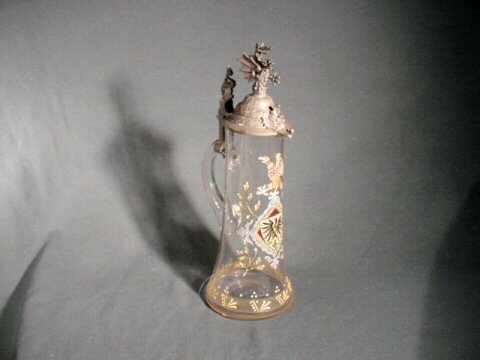 Absolutely beautiful and an important relic possibly from Prussian royalty. 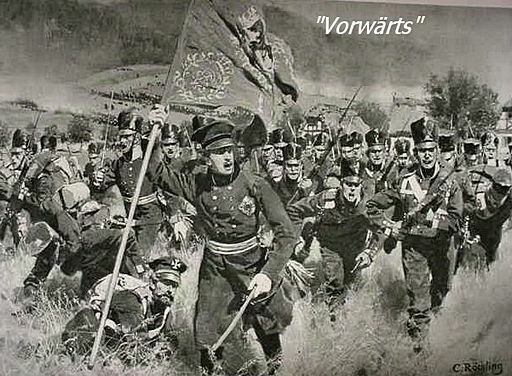 This is for the true Germanophile! 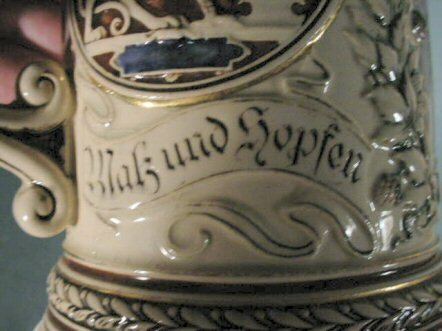 DESCRIPTION: Here is a rare little beer stein specially ordered in custom form for a company (maybe a brewery) in Philadelphia, Pennsylvania. We only can see the LBBC (company logo) on the lid. On the front is a typical German gentleman with Robert E. Lee beard. We only know his first name was Louis and the last name starts with “Bergd….” The rest is worn off. Sad to say this seems to be the only wear on the whole of the stein. 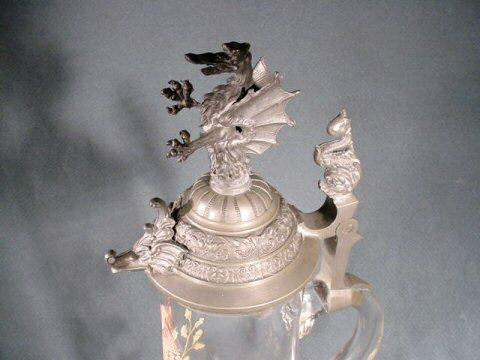 The legend across the front in literal translations seems to mean, “Malts and hops grant marvelous drops or dripping.” There are no apparent company marks on the bottom, but the style and pewter lid suggest that this fine Krug is German manufactured. 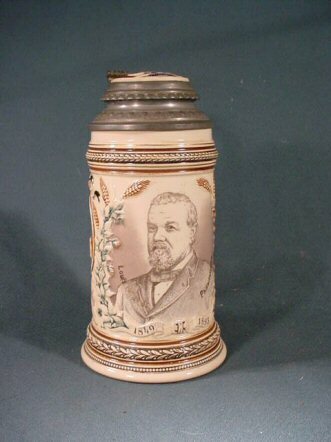 It is 8 inches high under the man’s picture it says “1849-1893.” A nice German-American memento of better times. 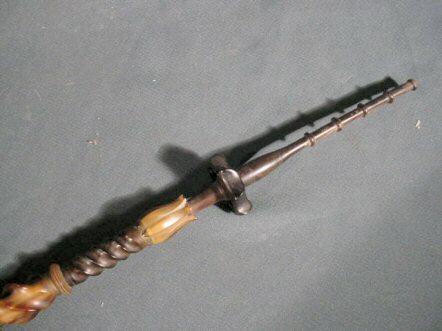 DESCRIPTION: Here is one of the most charming folk pipes we have ever seen. 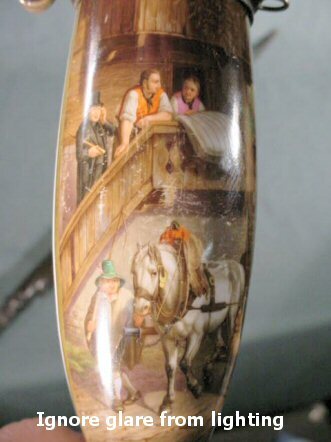 It has one of the finest scenes we have ever seen on one of these otherwise familiar Germanic items. Here is a scene of a gathering of these almost legendary mountain folk as they arrive for festivities in a remote Tyrolean village. The pictures we present will do more to explain the happening than we can do here; however, we can point out the magnificence of the rendering of the horse-drawn cart and the wearing of beautiful Trachten and the gaily adorned village, the typical mountain house with carved veranda, the mayor, who is the only one not in Tyrolean costume, and the magnificence of the Alps in the background. 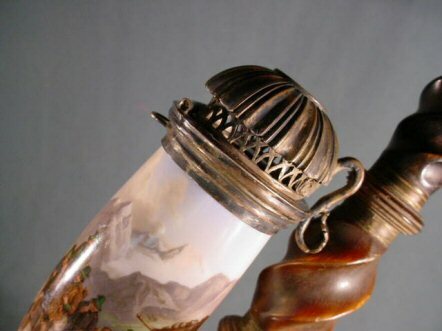 The artist’s usage of clouds and mountain peaks adds a fantastic charm to this lovely pipe. This is not a tourist piece by any means. 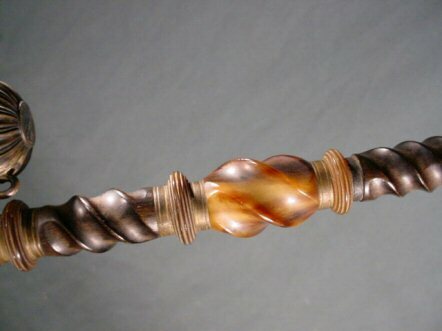 This you can tell by the quality of the stem carving executed in horn and wood, plus the great pewter cap that is put together cleverly so the pipe can be smoked while the cap is locked down. 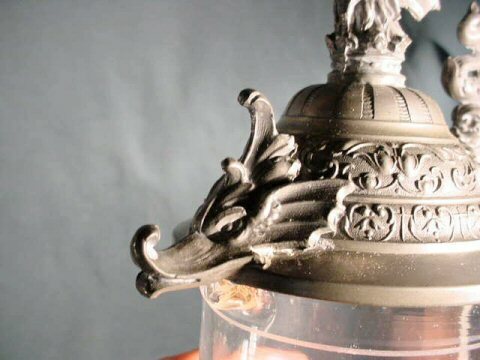 The top of the cap is decorated with the Bavarian Royal Lion and this often indicates a gift to royalty. We can certainly believe this possible with this particular piece as it is astoundingly beautiful, indeed. 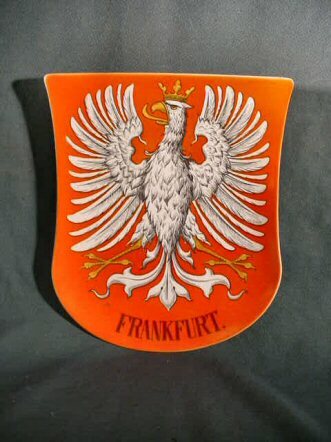 DESCRIPTION: If you are a true Germanophile and are as impressed with the Deutsches Adler (German eagle) as we are, then these plaques should send a shudder up your spine as they did for us when we found them. 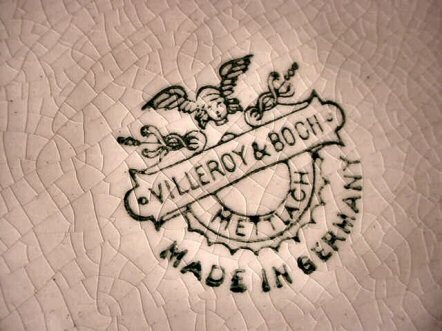 First of all they are numbered Villeroy & Boch (Mettlach) pieces; just as perfect and pretty as they could be. They are large 13 x 11 inches. 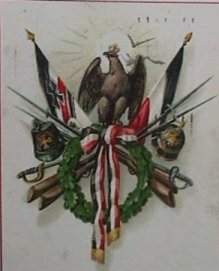 The first one depicts the German National Eagle with the 19 German states all depicted in his wings: Hisse, Bavaria, Saxony, Meklinberg, Lippe, Wurtemburg, etc. 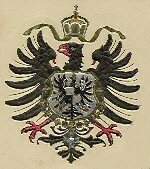 The crown of the Hohenzollern Empire is about the eagle’s head, while the particular Hohenzollern Eagle adorns his chest. The company marks and registration numbers are clearly marked on the back. 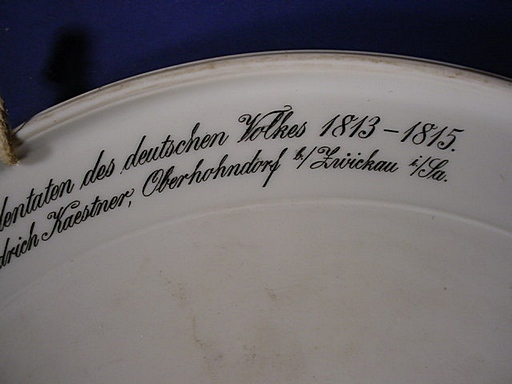 In the period 1920 to 1935 or so everything made by Villeroy & Boch was marked for export (“Made in Germany”) as well as for domestic use. This was a period before the worldwide demonization of Germany by her enemies. 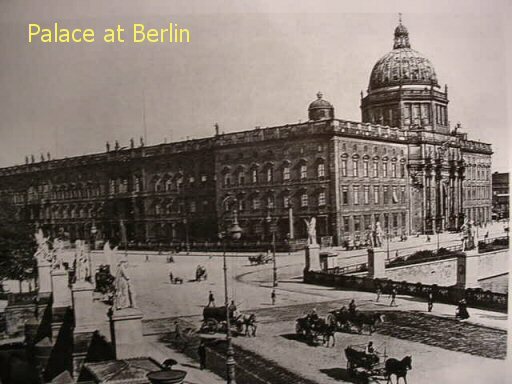 This was a period when the western world loved Germany again after the devastating fratricidal war. 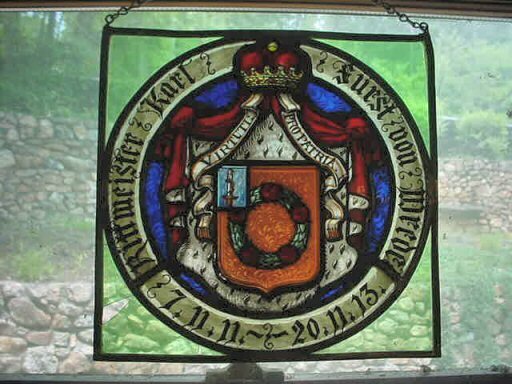 We are not sure if these plaques fall into that period or possibly pre-World War I in the turn of the century because the “Made in Germany” phrase also appears on merchandise of the era of the Kaisers--the late 1800’s until 1913-1914. The second plaque has the special eagle of the city of Frankfurt. This one is numbered with the patent protection words like the first Geschützt (protected) and also has the same number 1290 to show that it is of the same set. The shape is the same of course and the beautiful orange background is quite striking. The size is also identical. Together, this set is the ultimate Germanophile’s dream of Teutonic beauty sold as a set only and will make a fantastic wall decoration for your Berghof. 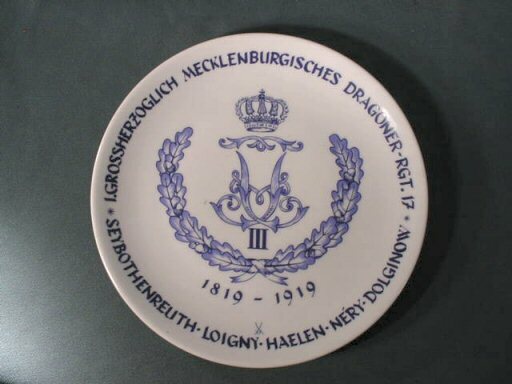 DESCRIPTION: This is remembrance plate from the first great Duke of Mecklenburg’s Dragoon Regiment 17, Company III, and below this are five battle honors from 1819-1919, the 100-year jubilee of the regiment. 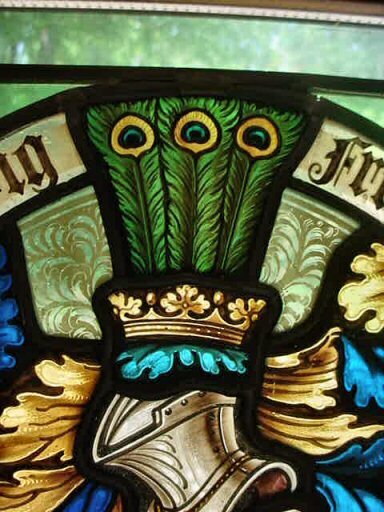 There is a pair of crossed swords under the wreath. 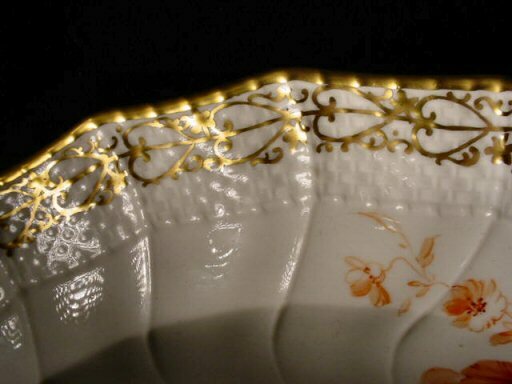 This usually signifies that is was made at Meissen. 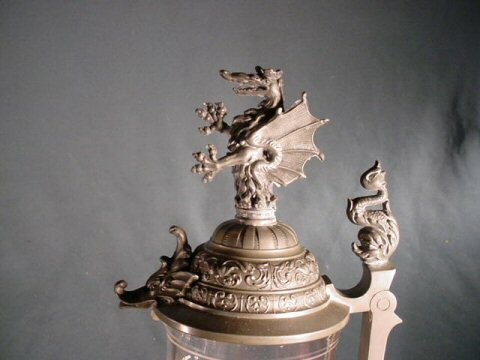 It’s in very fine condition and is unmarked on the back. It measures 9 1/2 inches in diameter. 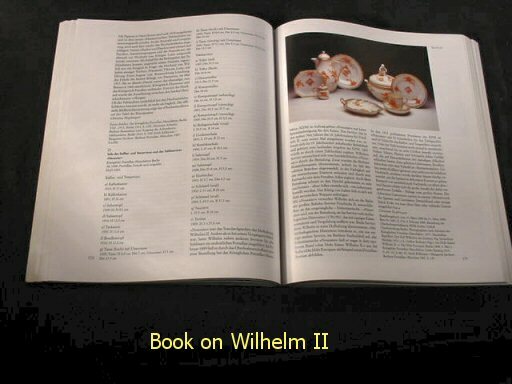 DESCRIPTION: Here are three pieces of the high-dinner service of Kaiser Wilhelm II. 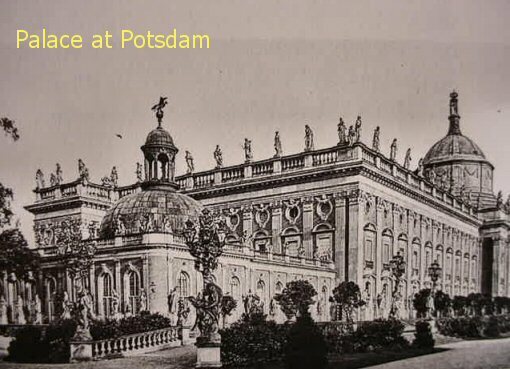 They are either from the royal Hohenzollern palace at Potsdam, or Berlin. 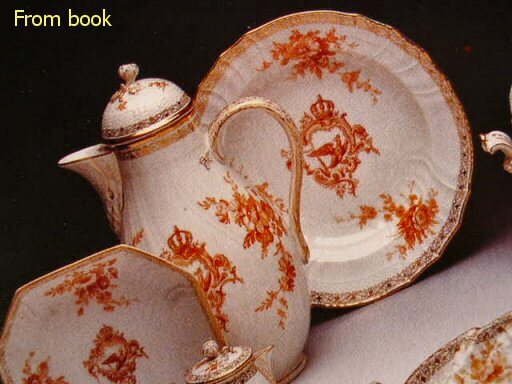 In several books on the Prussian Kaiser this pattern is shown. It was his favorite because it was virtually the same pattern used by his illustrious ancestor Frederick II, who reigned from 1740-1786. 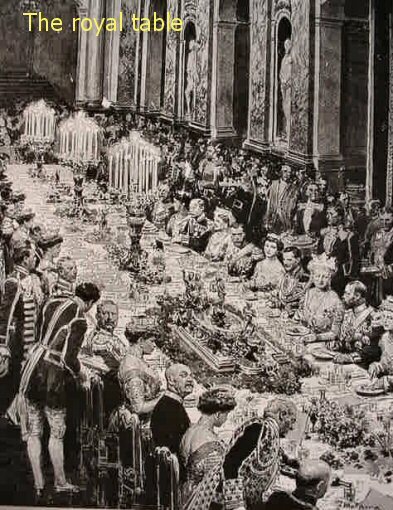 He was known as Frederick the Great and more affectionately as “Der Alte Fritz,” “the old Fritz.” Wilhelm II even relished dressing up like Frederick and sponsoring 18th-century flute concerts at the Potsdam palace. 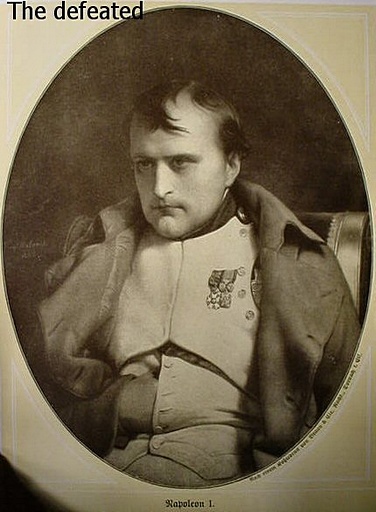 Frederick was beloved by the German people as well and was considered a military genius. 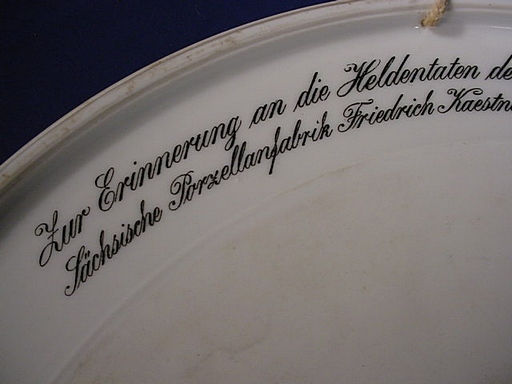 Napoleon visited Frederick’s grave at Potsdam and remarked to his officers: “Gentlemen, if this man were still alive I would not be here.” The plates bear the eagle that has come to be known as “der Friedrichadler,” or “the Frederick eagle.” The rest of the design is rococo style in vibrant orangish-red hue. 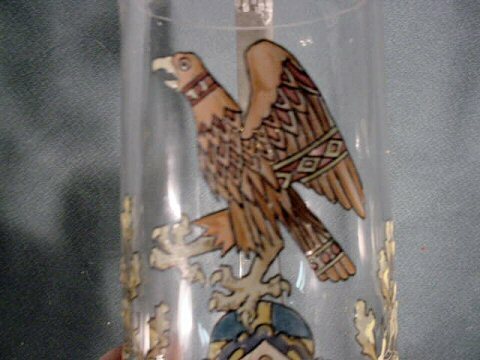 The eagle design is overlay gold gilting as are the edge designs. This is almost iridescent and very beautiful. 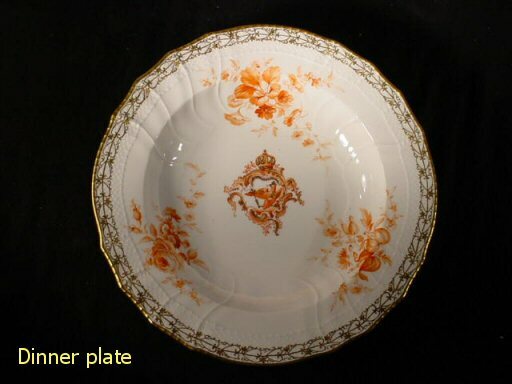 The plates are 9 3/4 inches in diameter. 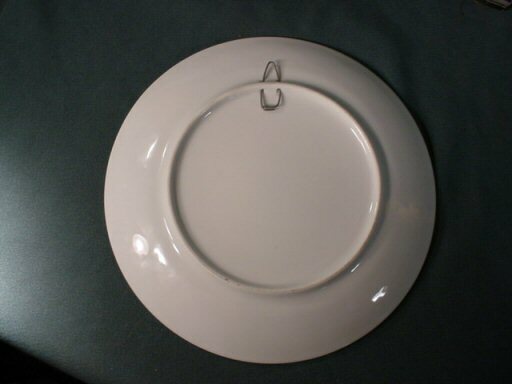 There are two plates and a bowl that are identical except that the bowl is slightly deeper. 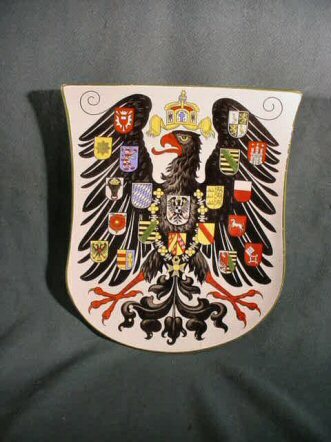 The Prussian Hohenzollern crown is seen at the top of the eagle design and the eagle has the “F R” for “Frederick Rules” in the center of his chest. 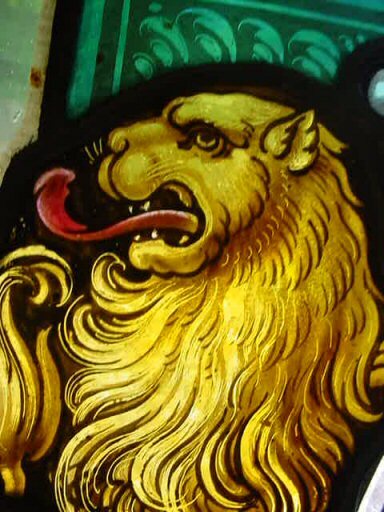 This symbol and the scepter and orb in his claws are highlighted also in gold gilting. The rose pattern is just gorgeous in three places. 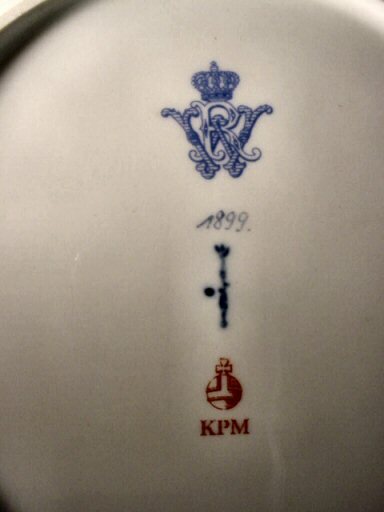 On the back of each piece is the mark of the scepter of royalty which is the mark of KPM (Königliche Porzellan Manufaktur), the king’s royal porcelain manufactory. 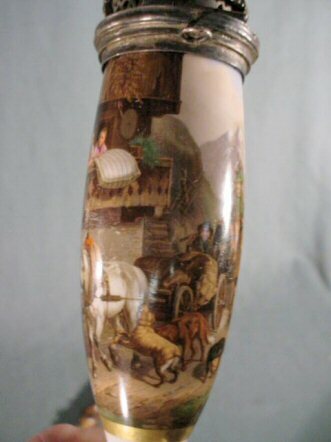 This is in blue underglaze. 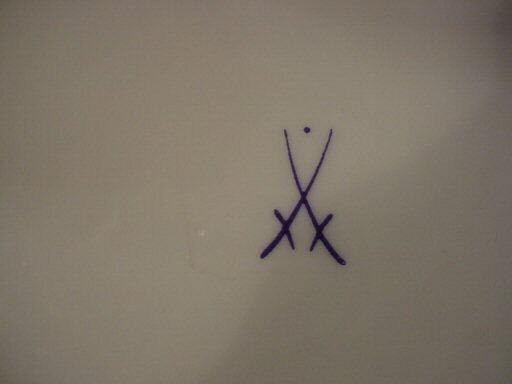 The other mark is the orb in a reddish hue in the underglaze. 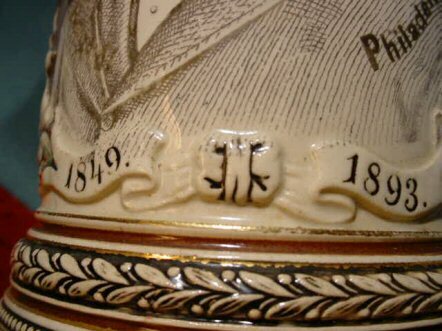 The most important mark that is seen in these particular pieces is the one at the top; the one in blue underglaze. 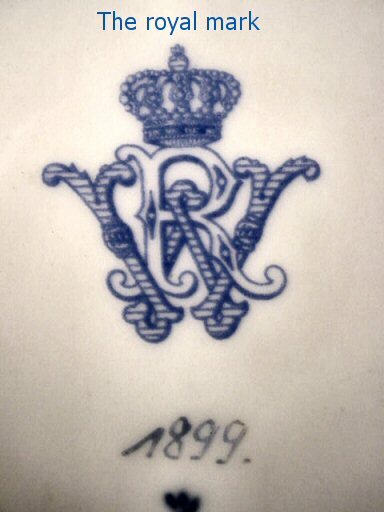 This mark is the largest of the three marks and it incorporates the Hohenzollern crown, and superimposed beneath is the “WR” for the reign of Wilhelm II. 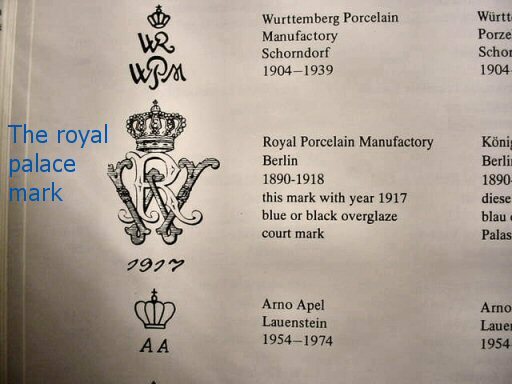 This mark is found only on pieces that were made for the royal court of the Hohenzollern kings and emperors. 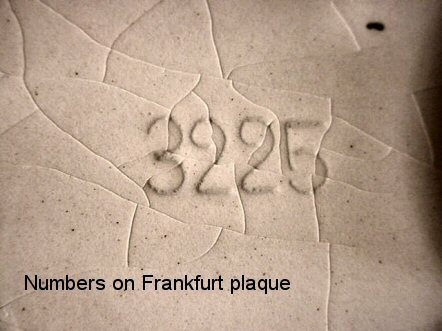 Each of the pieces has a date below this which might indicate the years that the particular pieces were ordered or added. 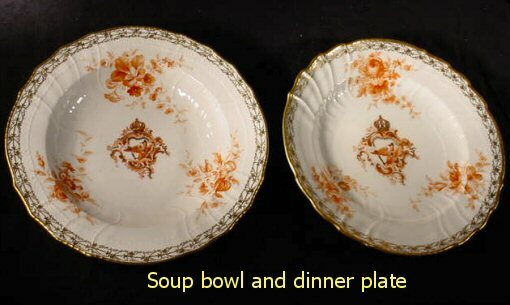 The bowl is dated 1888, one of the dishes is dated 1897, while the other is dated 1901. 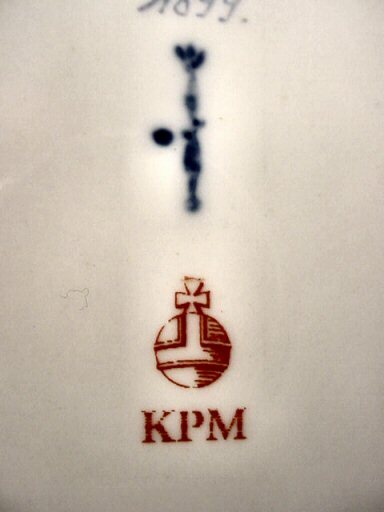 KPM was and is the most prestigious porcelain company in the world. 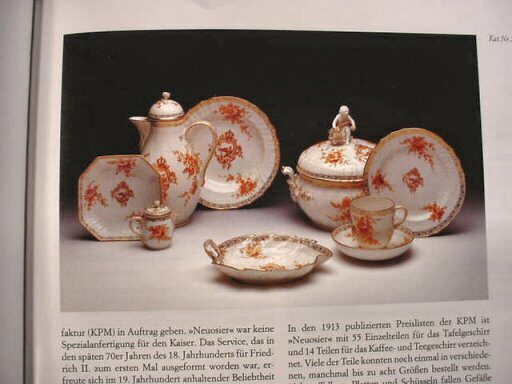 The firm was created by Frederick the Great in September of 1763, and it soon forged ahead and even left the Meissen Porcelain Manufactory in the dust. 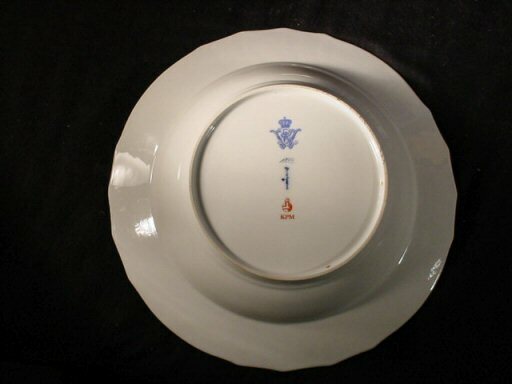 During the Kaiser Reich and even the Third Reich, KPM was the choice of all the important leaders when they “cared enough to send the very best.” Certainly these “Wilhelmesque” dishes are exactly that—the best! They’re extremely rare, but are being offered at extremely reasonable prices. DESCRIPTION: Here is my particular favorite. I love the graphics and the hand painting is superb. This one is done in the square framing with the central theme in circular motif. The almost iridescent blue leaves surrounding the theme just speak of later 19th-century elegance and decorum. The wonderful peacock feathers that emerge from the crowned jousting helmet are artistically superb. 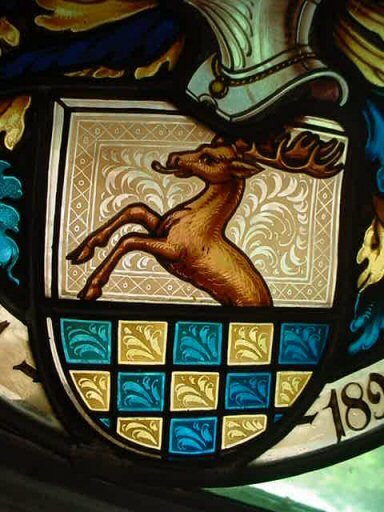 The rampant elk is shown on a field of floral design on the glass background. 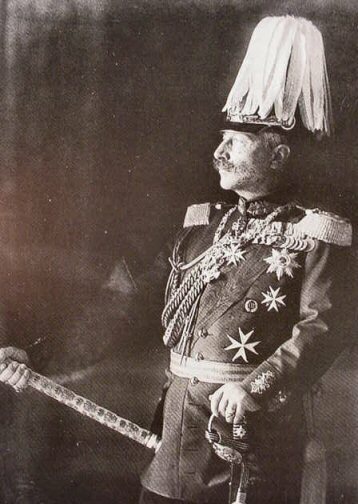 The name who commanded the veteran’s post from 1891 to 1899 was Major Ludwig Freiherr von Podewils. 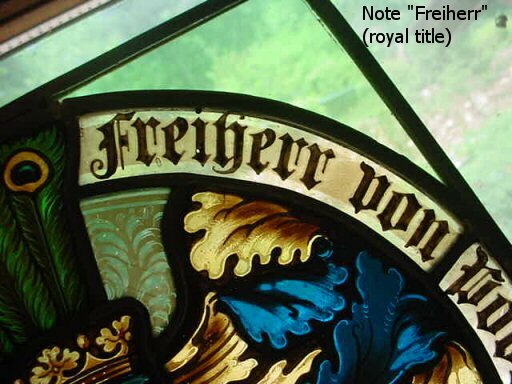 The term “Freiherr” is a word that translates to “baron.” That is a term of royal lineage. PRICE: $1,850.00: a bargain, indeed! PRICE: $1,880.00; this should be much more! DESCRIPTION: This is another beautiful example of this lost Teutonic art form; this one the most regal of all the collection; regal in that it is decorated in a motif that is decidedly royal. The crown is a prince’s coronet and flowing from this is a royal robe that drapes down to support the central crest that bears a wreath interspersed with red roses and a victory-wreath-wrapped sword. The robe is decorated with ermine tails and has a banner with the words “VIRTUTI PRO PATRIA,” which in Latin means: “With bravery for the native country.” The past commander of the veteran’s unit is seen going around the central motif. 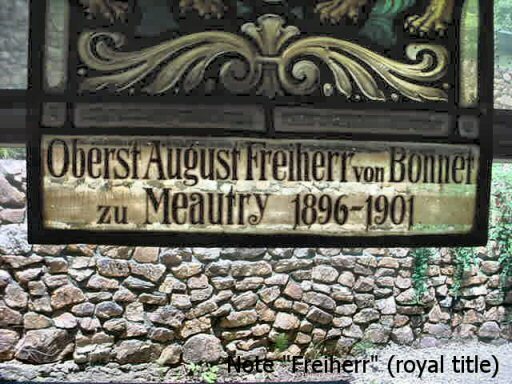 He was Rittmeister Karl Forst von Wrende and he served from 7/11/1911 to 20/11/1913. 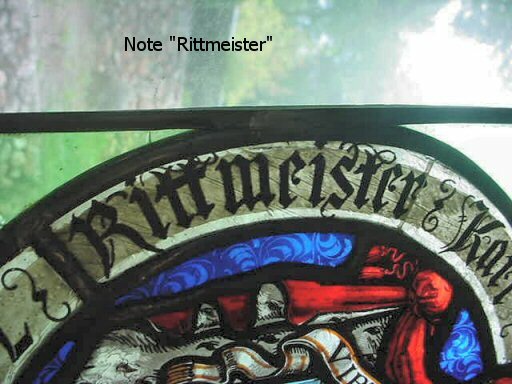 The term “Rittmeister” refers to a rank of captain of the cavalry. 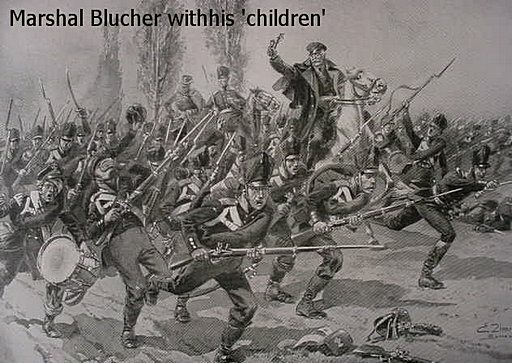 This could be Uhlans, Hussars, Cuirassiers, etc. 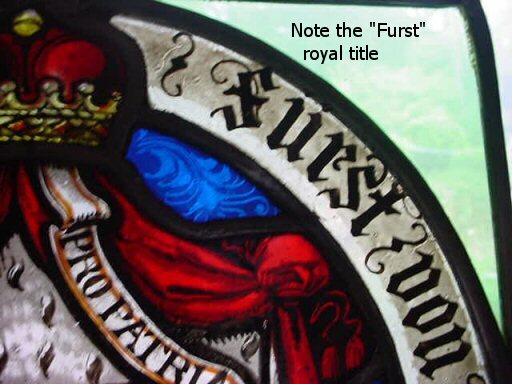 The term “Furst” means “prince.” So this man was a member of Prussian royalty. This is the most important one of the group. It is the only one that shows any damage; however, there is not damage in the central theme. It’s only the square framing where a couple of glass particles have been chipped away. 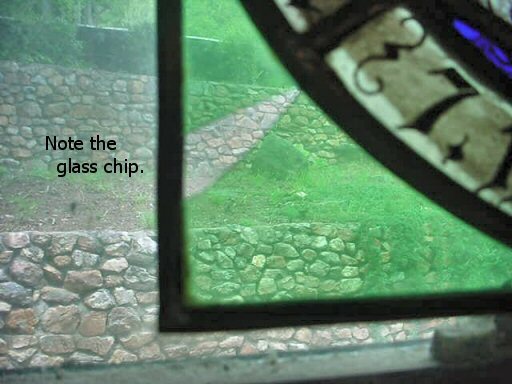 We repeat, noting is broken or chipped in the central leaded glass. This piece measures 10 x 10 inches square on the outside mounting and is the most elaborate presentation of all and surely the most important of the fantastic grouping. PRICE: $2,200.00; the best! of all of the collection! 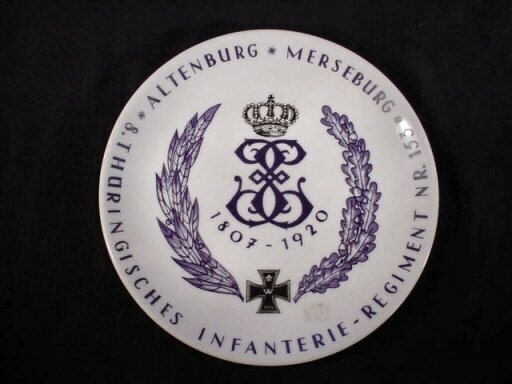 DESCRIPTION: This unit was stationed at Altenburg and Merseburg from 1807-1920. 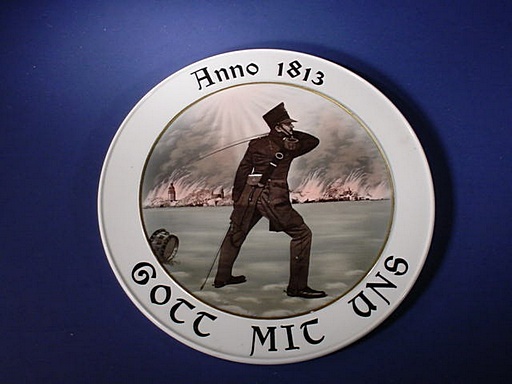 The plate features the cipher of the regiment and the Iron Cross with oak leaves on the right and laurel leaves on the left. 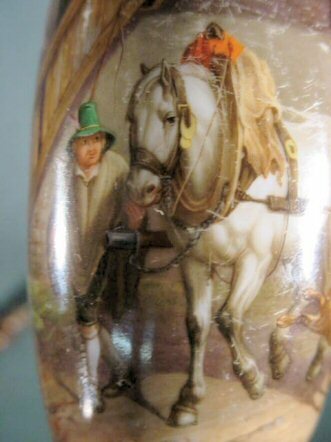 This great-looking piece has crossed swords under the glaze on the back (Meissen? 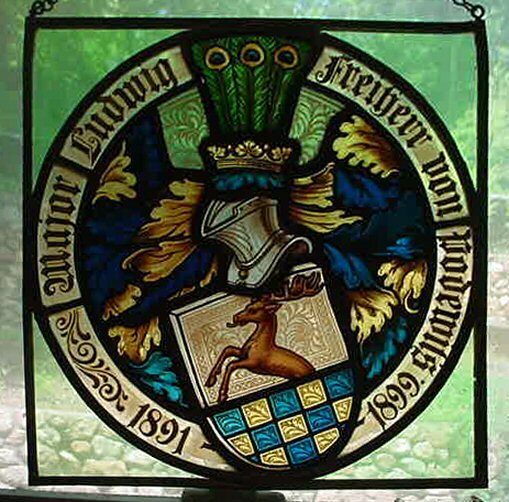 ), or is it possibly manufactured by other firms in Saxony that used this logo in different forms. 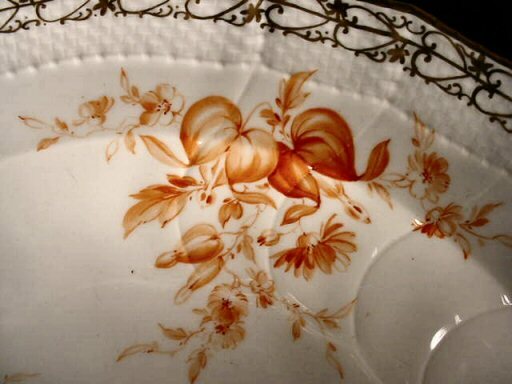 The plate is in perfect condition (no chips). DESCRIPTION: This is utterly fantastic! It commemorates one of the most famous battles of all the world’s history: the Battle of Nations by the city of Leipzig. We will not write out the history of that earth-shattering battle in Europe’s life-and-death fight against Napoleon because it is available in several locations on the internet. 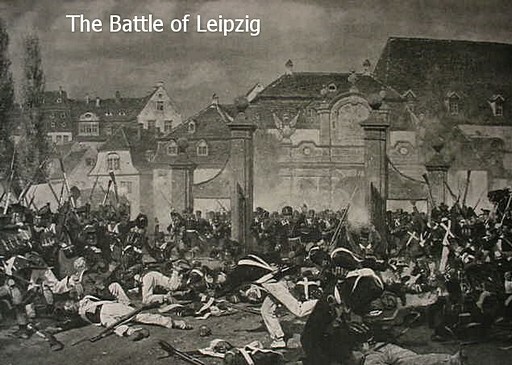 Look to Wikipedia under “the Battle of the Nations” or in German, “Volkerschlacht bei Leipzig.” This was one of the most decisive defeats suffered by Napoleon Bonaparte. 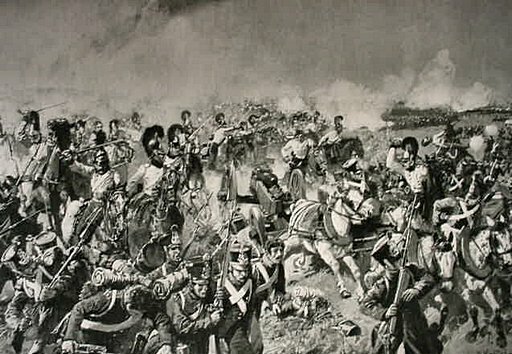 It’s considered the largest battle in Europe before WWI with over 500,000 troops involved: Italy, Naples, Duchy of Warsaw, Russia, Austria, Prussia, Sweden, the United Kingdom, and the French Empire under Napoleon. 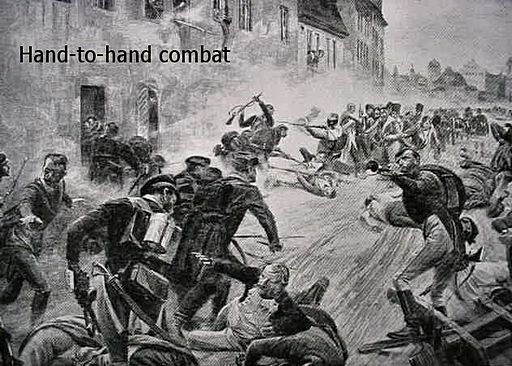 Sixty-seven thousand were killed or wounded. It was the beginning of the end for the Corsican corporal who up to now was the greatest military strategist and most powerful man in Europe (read about it; you’ll find it fascinating.) The plaque measures 11 1/2 inches in diameter and is in perfect condition. 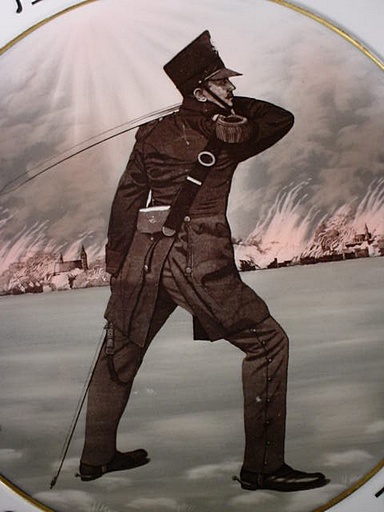 It depicts a Prussian officer who brandishes his saber menacingly against the French foe. Behind is the city of Leipzig in flames from the horrible conflict. 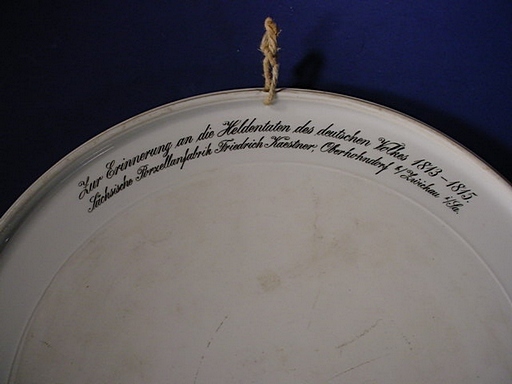 On the back is the legend as follows and translated: “In memory of the heroic deeds of the German people, 1813-1815. 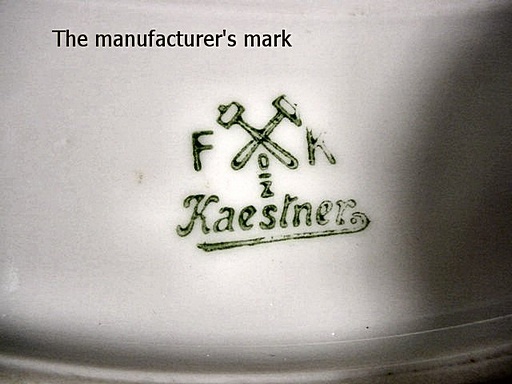 Saxon Porcelain Works Friedrich Kaestner, in Oberhohndorf by the Zwickau River.” At the bottom is the mark of Kaestner with the double hammers. 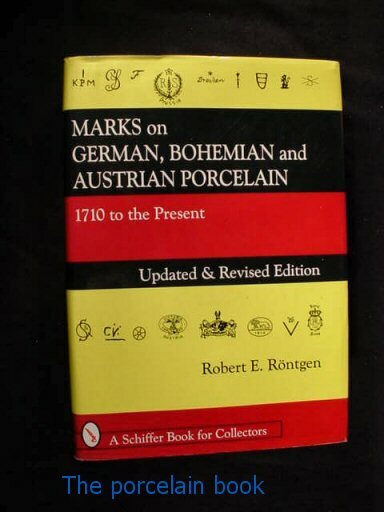 The firm is recognized and is listed in the book Marks on German, Bohemian, and Austrian Porcelain, 1710 to the Present. It was in business up to 1972. According to the mark we believe this was manufactured in about 1938. 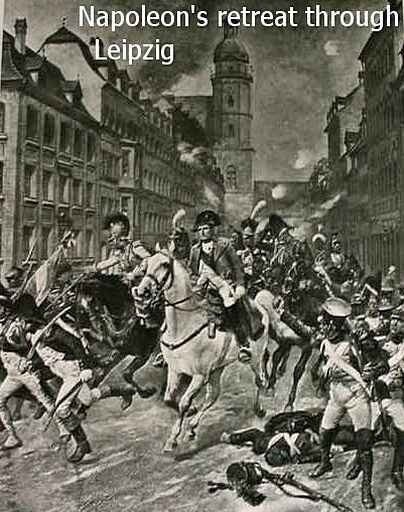 On the front is “Anno 1813,” representing the year of the Battle of Leipzig. 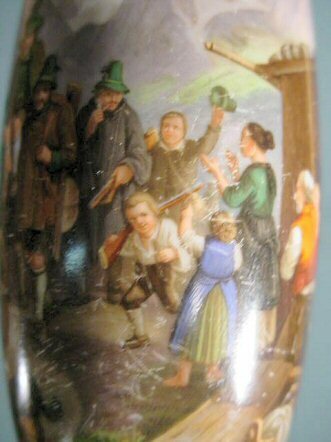 Under this it proclaims “GOTT MIT UNS,” “God with us.” The picture appears to be hand painted under the glaze. 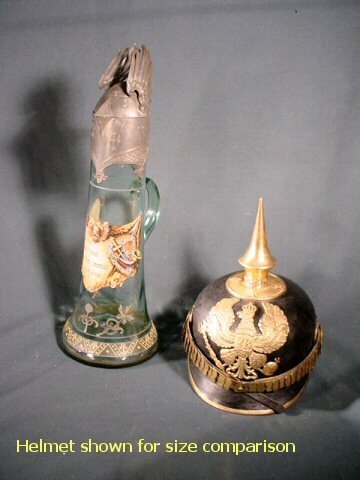 This is a beautiful, dramatic presentation; a museum-worthy investment piece; a Germanophile’s dream!